He denied the connection of the Jewish people to the land of Israel. In fact, he denied that there even is a Jewish people, claiming that Ashkenazi Jews are descended from a “Khazar kingdom,” a theory that is thoroughly discredited by genetic evidence (he considers Mizrachi Jews to be “Arab Jews”). He also claimed that there had never been any persecution of Jews living in Arab states. This is nothing new from Abbas, whose 1982 doctoral dissertation (submitted to the Patrice Lumumba University in Moscow) and a book based on it argue that the pre-WWII Zionist movement cooperated with the Nazis, and even incited them to murder the Jews in their power. According to Abbas, Zionists encouraged Western nations not to take Jewish refugees from Europe, so that they would go to Palestine. Abbas also questioned the number of Jews murdered in the Holocaust, and suggested that the numbers were exaggerated in order to gain sympathy for the establishment of a Jewish state. 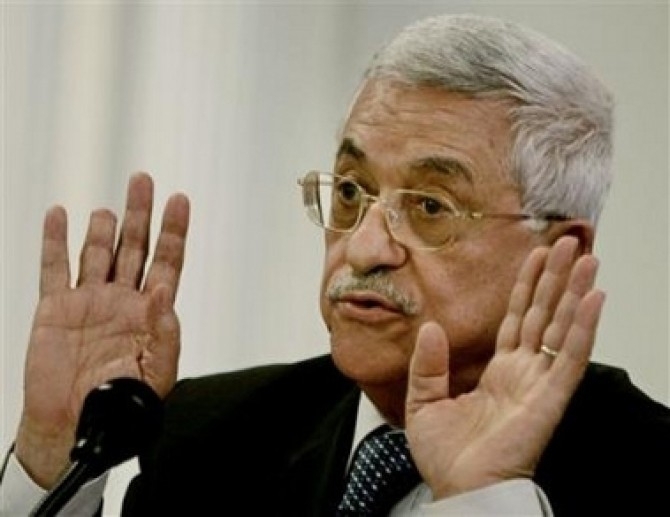 Although Abbas himself is very careful about what he says in English, he and Palestinian Authority spokespersons and media speaking in his name have time after time praised terrorists who have murdered Jews. When terrorists who have Jewish blood on their hands have been released from prison, he has ceremoniously welcomed them. And he has consistently refused to change the PA policy of paying salaries (from international aid funds) to imprisoned terrorists and their families. We bless you, we bless the Murabitin (those carrying out Ribat, religious conflict/war to protect land claimed to be Islamic), we bless every drop of blood that has been spilled for Jerusalem, which is clean and pure blood, blood spilled for Allah, Allah willing. Every Martyr (Shahid) will reach Paradise, and everyone wounded will be rewarded by Allah. The Al-Aqsa [Mosque] is ours, the Church of the Holy Sepulchre is ours, and they have no right to defile them with their filthy feet. We will not allow them to, and we will do everything in our power to protect Jerusalem. What is particularly notable about his most recent remarks is not their content. He has been saying these things for decades. Following his mentor, Yasser Arafat, he speaks out of one side of his mouth in English, projecting an image of moderation, while calling for jihad in Arabic. What was different this time was the reaction. Mr. Abbas’s vile speech was a new low. No doubt he feels embittered and besieged on all sides. But by succumbing to such dark, corrosive instincts he showed that it is time for him to leave office. Calling murderers heroes wasn’t vile? Talking about the Jews’ “filthy feet” wasn’t a new low? Inciting violence and paying for it with (mostly) American and European money wasn’t reason enough to call for him to leave office? Apparently not for the Times. So what is this line that he’s crossed? When Abbas made the “filthy feet” statement, which was a direct cause of deadly violence, the only mentions in the Times that Google and I could find were a quotation in a news article, and a letter to the editor from the Israeli Embassy. There were no editorials, or even op-eds denouncing Abbas’ murderous incitement. It seems to me that what triggered the avalanche of disapproval was the double whammy of bringing up some of the ancient themes of European antisemitism, plus the mention of the Holocaust. Abbas has revisited medieval antisemitic libels before, as in 2016 when he said that Israeli rabbis were poisoning Palestinian water sources. He was criticized then by the liberal Union for Reform Judaism. But this time, it was the Holocaust reference that brought the brass ring. There has always been an irony in the fact that the more that liberal American Jews move away from supporting Israel, the more strongly they feel about the persecuted Jews of the past, particularly the victims of the Holocaust. It’s as if they wish to compensate for abandoning the Jews of Israel, who are the likely targets of Jew-hatred today, by engaging in emotional catharsis over the dead Jews of 75 years ago. Many liberal Jews have distanced themselves from Judaism, the Jewish people, and Israel. They have very little left of their Jewish identity except some nostalgic food preferences – and a strong feeling about the Holocaust, nourished by popular literature and movies. They believe that there is a difference between anti-Zionism and antisemitism, even though the irrational demonization of Israel and Israelis that is part of today’s anti-Zionism is truly antisemitic. They are prepared to entertain the idea that the IDF targets Arab children, or that Israel is an apartheid state, or even that it is committing genocide against the Palestinians. When they hear these libels from Abbas and others, they just nod. But when he blamed the Jews for the Holocaust, they had a problem. It’s too close to what they think of as “real” Jew-hatred, the stuff that Nazis did. Progressives find it hard to criticize Muslims for antisemitism, because they are afraid of slipping into “Islamophobia,” which they believe is as bad or worse. But Abbas got to them. Maybe he made them think about the true nature of Muslim Jew-hatred. I don’t expect the New York Times to ever promote Zionism. I don’t think most American liberal Jews will ever feel themselves a part of the Jewish people, the way I think most Israelis do. But I would like to thank Mahmoud Abbas for doing his part in opening their eyes, at least a little.